On the planet Elystra, the all-female Ixtrayu tribe have thrived, hidden from their world's male-dominated societies for eight centuries. Thirty-five generations of Protectresses have safeguarded their sisters from the men who would destroy them for the Elemental power they wield. But how did it all begin? . Seeking riches and power, a band of vicious slavers steal twenty girls from their homes, as well as the Agrusian Stone, long fabled for its beauty and pricelessness. Among the abducted is Sahria, an eighteen-year-old novice, determined to free herself and return home. When the Stone unexpectedly imbues her with her god's divine power, she realizes freedom for herself and her sisters is within her grasp ... but to save them all would mean leaving behind everything she's ever known. With a slaver's market looming, Sahria must make a choice: escape and return to the safety of her Order, or embark on a far more dangerous path, one where mere survival is only the beginning. This story starts with Sahria and several other girls captured to be sold as slaves. Sahria becomes like a mentor to them, watches over them, and tries to keep their hopes up as they try to survive the trip with the slavers. I really liked watching Sahria grow into her role and how all of the girls came together during one of their worst events that could happen in someone’s life. The side characters were great also, I liked the glimpses we got into each of their lives before they were captured. I especially liked Kithya and how her and Sahria were there for each other and cared for each other when the other was weak. The way that Arantha and her powers were woven into the story and the girls lives was great. I liked everything about this book. I’m not usually much of a prequel reader, but the writing was so good that I was completely drawn into the story, and I was absolutely invested in the plot and characters. This is a great introduction to this series and the characters, and how their tribe got started. If you like stories of overcoming great odds and stories of friendship and love, you will love this book. 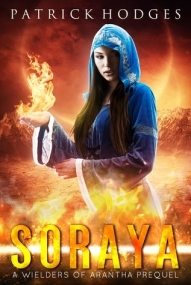 SORAYA is a prequel that introduces the reader to how the all-female Ixtrayu tribe came to be. After reading PAWNS, this was very eye-opening and made me understand the Ixtrayu better. It made me respect them more and it was nice to know the detailed reason why they went into hiding in the first place. We learn about Soraya, the originator of the Ixtrayu clan, and how she was kidnapped along with other women to be sold as slaves. But they aren't going down that easily. Soraya is strong-minded and strong-willed and gives the other women hope. She's a character that anyone can look up to and her story draws out so many different emotions. If you're a fan of Patrick and his WIELDERS OF ARANTHA series, then this is one you can't miss out on. It expands even more on the world-building and makes me enjoy this series that much more. This series is perfect for fans of action, adventure, sci-fi, and strong women.